Save as various output formats. Recognize multilingual characters in images. 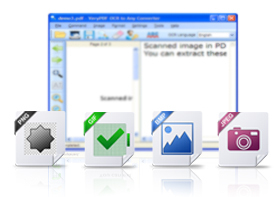 VeryPDF OCR to Any Converter is an application developed for recognizing characters in images. It supports input files in BMP, GIF, JPEG, PNG, TIFF, and PDF. Recognized text can be saved to format of Microsoft Word (doc, docx), Excel (xls, xlsx), RTF, XML, and TXT. It can edit the fonts, text case and check the spelling before saving the recognized text. VeryPDF OCR to Any Converter can recognize characters in images of formats, BMP, GIF, JPEG, PNG, and TIFF. Scanned image capsulated in PDF is also supported. With this application, you can recognize characters from images of common formats. After recognizing the text from images, you can set the font, font color, font size, check the spelling errors, and then save to Microsoft Word (doc, docx), Excel (xls, xlsx), RTF, XML, or TXT. After recognizing the texts, you can directly save them to Word or TXT for future editing. The application support not only English as default, but also other languages. You can download OCR packages for other languages from the interface. After downloading one language package, you can recognize characters in that language with this application. Directly recognize images scanned from scanner. Support input file formats of BMP, GIF, JPEG, PNG, TIFF, PDF and TXT. 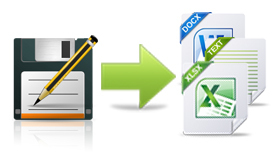 Support output file formats of Word (doc, docx), Excel (xls, xlsx), RTF, XML, and TXT. Support recognition of multiple language characters. Pre-process (de-skew) image before recognition. Change image page orientation before OCR. Edit recognized text before saving. Monitor and automatic recognizing images in a specified directory. Use custom dictionary to check OCR result. Provide accessories for merging TIFF, merging PDF and spitting PDF.